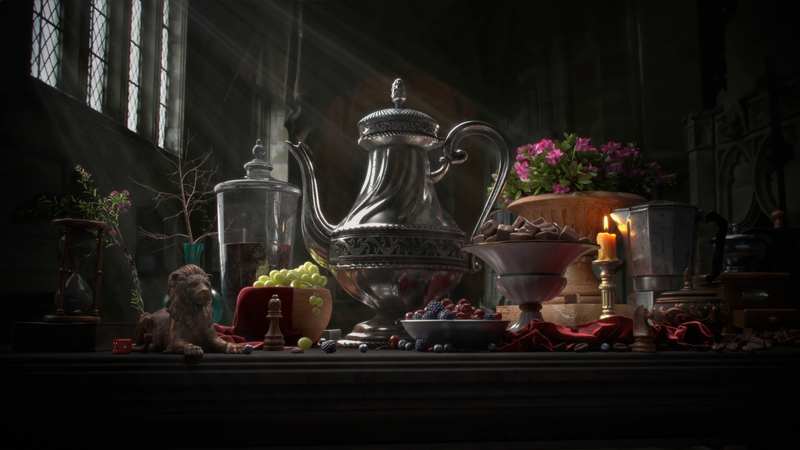 The main task of the project was to shoot an HDRI and a backplate with a DSLR and then add CGI Still Life elements and make light and grain match. I shot my HDRI with Canon 5D mark III in Christchurch Cathedral, Dorset, UK. I modelled and sculpted some props using Maya, Mudbox and Zbrush, but some models were made for me by Ola Batko, and some others I downloaded from turbosquid.com, cgtrader.com, free3d.com and 3dsky.org. One of the mistakes I made, was focusing more on quantity than quality. I decided to go for a lot of details and I spent a lot of time adding new objects and repositioning everything. It was also quite challenging because it is an original piece and I didn't have an exact reference for lighting so I had to make things up a bit.